There are many health benefits of oatmeal. Currently, many nutritionists and health experts advise oatmeal consumption in our daily lives. 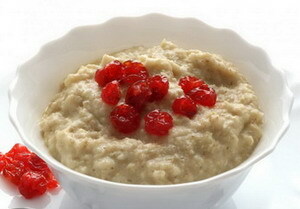 oatmeal is an appropriate alternative in maintaining a healthy life. Oatmeal is high in fiber, oatmeal provides magnesium, protein, phosphorus and vitamin B1 (thiamin), which plays an important role in producing energy. Oats have a high nutrient content. There is a protein (gluten), iron, magnesium, zinc, copper, manganese, vitamin B1, folic acid, and vitamin E. The amount is higher than other cereals such as wheat, corn, rice, and rye. One cup of oatmeal made ​​from 40 grams of oats (half a cup) gives us at least 150 calories, 4 grams of fiber, 3 grams fat, 27 grams carbohydrates 27 grams, and 5 grams of protein. However, oats do not contain vitamin A, vitamin C, and calcium, so sometimes there are oats enriched with these nutrients. Oatmeal is a rich food source of soluble fiber, which is also found in apples, pears and prunes. Soluble fiber can inhibit the body's absorption of LDL cholesterol, commonly known as bad cholesterol. One and a half cup of oatmeal contains more than five grams of fiber, which is enough to reduce your cholesterol level. The high fiber content of oatmeal not only offer health benefits to the heart, but also a reduced risk of high blood pressure. A rekomedasi for menopausal women, who tend to be at risk of developing hypertension, should eat at least six servings of oatmeal or other grains every week. Studies show that men can reduce the risk of heart failure if they eat a bowl of whole grain cereal or oatmeal, per day. Oatmeal contains a special type of antioxidant called avenanthramide. Antioxidants are able to fight free radicals that attack known as HDL or good cholesterol. In addition, this compound also protects the bad cholesterol (LDL) from oxidation, which reduces the risk of cardiovascular disease. Avenanthramides not only protects against heart disease, but these antioxidant compounds are also able to prevent arteries from hardening. Avenanthramides works by suppressing the production of molecules that allow to prevent hardening of the arteries. Research has shown that postmenopausal women who ate six servings of cereals whole week can reduce the risk of developing atherosclerosis. Ateroskleorosis is a condition in which there is accumulation of plaque along the halls of the blood vessels and slow the progression of stenosis, leading to the halls of the arteries to narrow. Oatmeal benefits for cardiovascular health will be greater when paired with vitamin C.
Research has shown that women who consume high amounts of fiber had a reduced risk of breast cancer, especially if it comes from corn fiber. Insoluble fiber in whole cereals will attack carcinogens and lower levels of estrogen in the body, thus protecting the body from cancer development. A study in England found that pre-menopausal women have a reduced risk of breast cancer by 41 percent just by eating fiber from whole grains or cereals intact. In addition to fiber, oatmeal is a source of magnesium, which is able to regulate insulin and glucose levels. Findings have shown that, for eight years, women who ate a diet rich in cereals can reduce the risk of diabetes by 31 percent. To get optimum benefit, you can add the milk to the oatmeal. The addition of low-fat milk can also lower the risk of diabetes. Oatmeal contains some type of fiber called beta-gluten fiber. These fibers can protect you against heart disease and also boost the immune system. It helps the immune cells in the search for and repair areas on the body to infection bacteria. Because oatmeal is rich in fiber, it will keep you fuller for a longer period of time. Fiber will increase the viscosity of the contents of the stomach so it will take longer to clear. Feel full for a longer period of time will also prevent the need for sweet or salty snack foods throughout the day. Research has linked lower risk of obesity in children who regularly eat oatmeal. Adults and children who suffer from celiac disease can not eat gluten generally (a protein compound found in wheat), but research shows that they can eat oatmeal though it contains little gluten. Celiac is a syndrome in which the colon is unable to absorb nutrients from food.